Professor, Doctor of Medicine and Chairman of the Nordic Traffic Medicine Association. Injuries child gets in a rear facing seat are normally small compared injuries child gets in a front facing seat. Compared with an adult, a baby’s head is four times as heavy in relation to the rest of the body. A baby’s neck is not sufficiently developed to hold its head up. A baby therefore needs extra support and protection in the head and neck region. In a collision, a safety belt that goes across the stomach can cause injuries to the liver, kidneys and spleen. The belt must be designed to go over the child’s hip region, or as a Y-belt with a strap between the child’s legs. In side-on collisions the risk of injury is proportionally greater than in collisions from the front or back. Nevertheless, it is only recently that intensive research has been carried out into side-on collisions. Nowadays children’s car seats are available with effective reinforcements in the sides, which have been crash tested over and beyond the requirements for ECE approval. Children’s car seats in advanced designs, which are made to withstand these collisions, are often reinforced with metal. The smallest kids should always sit in the middle of the backseat. It can be dangerous to move about in traffic. However, we need to do so for practical reasons. It is necessary to provide our children with the very best protection possible. Up to the age of four years, it should be standard practice that they travel facing rearwards in specially designed children’s seats. The reasons are very simple: A forward-facing seat increases safety by 50%, while in a rearward-facing seat, safety is increased by 90-95%! As parents, we carry the main responsibility for our children’s safety. We must protect them as well as we can, in traffic too, and make sure that everyone in the car is securely and safely restrained. Trygg Trafikk recommends that young children are secured rear-facing for as long as possible. 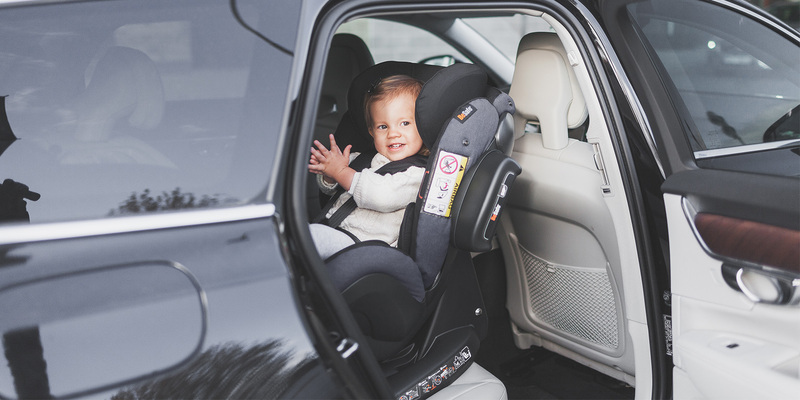 ‘Trygg Trafikk recommends that young children are secured rear-facing for as long as possible, preferably until they are at least 4 years of age. We have the impression that many parents are aware that a rear-facing position is recommended, but believe that the difference is not as great as it actually is. A survey we carried out in 2009 indicated that only 3 out of 10 young children are secured in a way that provides the most optimum level of safety. We are therefore working continuously to inform parents and persuade them to choose rear-facing child seats for young children. Children who are properly secured and rear-facing often sustain no injuries. The most powerful collisions we are likely to be involved in are front collisions and in such collisions a rear-facing child seat reduces the risk of injury by around 85%, compared to 50% in a forward-facing seat. Children who are properly secured and rear-facing often sustain no injuries, even in very serious collisions. Tommy Petterson is responsible for collision testing at VTI (the Swedish National Road and Transport Research Institute) in Linköping, Sweden. VTI is one of Europe’s leading institutes for research and testing on child car seats. Tommy has worked there for over 20 years. Many years of research, collision tests and accidents have shown us that rear-facing child car seats are by far the safest. This is demonstrated by the difference in injuries and deaths in children between different countries, for example Sweden and Germany. It is compulsory for all children under 9 kg to sit rear-facing. However, for children over 9 kg, we see a big difference between the numbers of seriously injured and dead children in Germany (where children face forwards from 9 kg) and Sweden (where children sit rear- facing until they are four or five). Therefore, we in Sweden have developed the Plus test. The Plus test is one of the world’s toughest tests on child car seats. In the Plus test, we have focused on one of the collisions that have the most severe consequences, the head-on collision. In a standard approval test, child car seats are subjected to up to 28 g, while in the Plus test they are subjected to up to 38 g.
The reason for the introduction of the Plus test was that, up to 2008, Sweden had a T-approval in which the tensile load on the neck was tested. Too much tensile load produces severe injury or death. When the T-approval was abolished in 2008, there was a need for a new test and the Plus test, a voluntary test for which producers can submit their products if they want, was introduced. The aim of the test is to distinguish between good and bad child car seats. Those that pass the Plus test are exceptionally good. At present, there are no forward-facing child car seats that have even come close to passing the Plus test. I recommend rearfacing child car seats as long as possible, and preferably up to 4-5 years. Small children have heads, bones and muscles that are not fully developed. In a frontal impact will a correct rear-facing child car seat almost eliminate the risk of serious neurological damage and death in young children. In a frontal facing child seat will the child’s head go forward in the direction of a frontal impact, and the risk of serious head and neck injuries increases. Rear facing child car seats reduce the risk of the child from slipping out of the harnesses in a crash, so that they have life-threatening injuries. We have seen several of cases were children have had serious injuries or got killed in an impact. If it is difficult to find room for a rear-facing childseat, is it recommended using the space in the middle of the back seat of the car. We have seen that correct rear-facing safety have saved several of small children. If the front passenger seat is used with a rear-facing child seat must the airbag be disconnected.